Economic disruptions such as technological change, immigration flows, or international trade liberalisation create winners and losers. Some workers have their wages cut or lose their jobs. Others, often the highly skilled, reap the benefits. These disruptions may significantly increase inequality. In public economics, solving the problem involves designing a reform of the tax and transfer system to offset the welfare losses of the losers by redistributing the gains of the winners (Kaldor 1939, Hicks 1939, 1940). In a recent paper (Tsyvinski and Werquin 2018), we solve this problem in a general environment where redistribution can only occur through a distortionary labour income tax schedule,1 and individual wages are endogenous. It reduces the wage of the low-skilled natives, because the marginal product of labour is decreasing. It raises the wage of the high-skilled natives due to complementarities in production. Suppose that to compensate those negatively impacted by the disruption, the government lowers their tax rate. Since taxes are distortionary, the substitution and income effects of this policy shifts the labour supply of these agents. In turn, the wage distribution changes through both general-equilibrium channels described above. Therefore, the tax reform induces welfare consequences analogous to those it was meant to compensate in the first place. Designing the compensating tax reform is therefore a complex fixed-point problem. Our main result is a closed-form solution to this problem in a general environment, as a function of simple sufficient statistics that can be estimated empirically. Therefore, the compensating tax reform can be easily implemented in practice. Its effect on the government budget, also derived in closed form, can be positive or negative. The value of the fiscal surplus after redistribution gives researchers and policymakers a meaningful way to compare the aggregate welfare gains or losses of various disruptions – for example, to compare international trade and technological change. In our model, agents, indexed by their skill, choose their labour supply both on the hours and participation margins as a function of their wage and their (average and marginal) tax rates. The production function aggregates the labour supplies of all skills, and wages are equal to the corresponding marginal products. In this initial economy, consider an exogenous shock (for example, to the production function) that changes relative wages. In response to this disruption, the government can implement a non-linear tax reform: it can modify the average and marginal tax rates at each income level. As a result, individuals adjust their labour effort which, in general equilibrium, alters the wage distribution, leading to further labour supply adjustments, and so on. The compensating tax reform is constructed so that the welfare of each individual is the same in the new (perturbed) equilibrium as in the initial economy. We focus on marginal disruptions or, equivalently, on compensating the first-order welfare effects of the disruption. Therefore, our results can be applied to counteract the impacts of robotisation, immigration, or changes in tariffs – but are less suitable for one-time large events like the China shock (Autor et al. 2016). elasticities of substitution between skills in production. We are able to show that taking the general equilibrium forces into account is crucial, because they imply that both the average and the marginal tax rates of the reform affect individual welfare. Both tax instruments must thus be determined simultaneously. Specifically, while higher average tax rates reduce welfare by making agents poorer, higher marginal tax rates raise welfare by lowering their labour supply and hence increasing their pre-tax wage. We obtain that the compensating tax reform is progressive, with the rate of progressivity given by the ratio of the elasticity of labour supply to the elasticity of labour demand, net of the progressivity of the initial tax schedule. We applied our closed-form formula to the compensation of automation in the US between 1990 and 2007. Acemoglu and Restrepo (2017) estimated the impact on the wage distribution of one additional robot per 1,000 workers. The top panel of Figure 2 shows their estimates, taken from Figure 13 of their paper. Sources: Acemoglu and Restrepo (2017), Tsyvinski and Werquin (2018). The estimates show that the wage at the first decile decreased by slightly less than 2%. At the ninth decile, it increased by 0.5%. 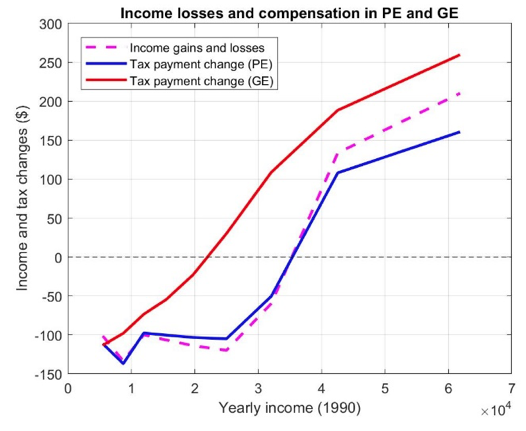 The bottom panel of Figure 2 plots the before-tax income losses implied by this wage disruption (dashed purple line), plus corresponding compensations in partial equilibrium (solid blue line) and in general equilibrium (solid red line). For simplicity, we assumed a CES production function. We find that the tax payment of agents at the first decile of the wage distribution must decrease by 110% of the income loss that they suffer from the disruption, and at the ninth decile increase by 125% of the equivalent income gain. The disruption and its compensation are roughly budget neutral. In our paper, we are also able to apply our formula to the compensation of automation in Germany using the estimates of Dauth et al. (2017). Antras, P, A De Gortari, and O Itskhoki (2017), "Globalization, Inequality and Welfare", Journal of International Economics 108: 387-412. Autor, D H , D Dorn, and G H Hanson (2016), "The China Shock: Learning from Labor-Market Adjustment to Large Changes in Trade", Annual Review of Economics 8: 205-240. Card, D (2009), "Immigration and Inequality", American Economic Review 99(2): 1-21. Dauth, W, S Findeisen, J Südekum, and N Woessner (2017), "German Robots – The Impact of Industrial Robots on Workers", IAB discussion paper 30/2017. Hendren, N (2014), "Efficient Welfare Weights", NBER Working Paper 20351. Hicks, J R (1939), "The Foundations of Welfare Economics", The Economic Journal 49(196): 696-712. Hicks, J R (1940), "The Valuation of the Social Income", Economica 7(26): 105-124. Kaldor, N (1939) "Welfare Propositions of Economics and Interpersonal Comparisons of Utility", The Economic Journal: 549-552. Kaplow, L (2004), "On the (Ir)relevance of Distribution and Labor Supply Distortion to Government Policy", Journal of Economic Perspectives 18(4): 159-175. Kaplow, B L (2012), "Optimal Control of Externalities in the Presence of Income Taxation", International Economic Review 53(2): 487-509. Katz, L F and K M Murphy (1992), "Changes in Relative Wages, 1963–1987: Supply and Demand Factors", The Quarterly Journal of Economics 107(1): 35-78. Tsyvinski, A, and Werquin, N (2018), "Generalized Compensation Principle", NBER Working Paper 23509. Kaplow (2004, 2012) and Hendren (2014) have extended the Kaldor-Hicks principle to the case where governments have access only to distortionary tax instruments. 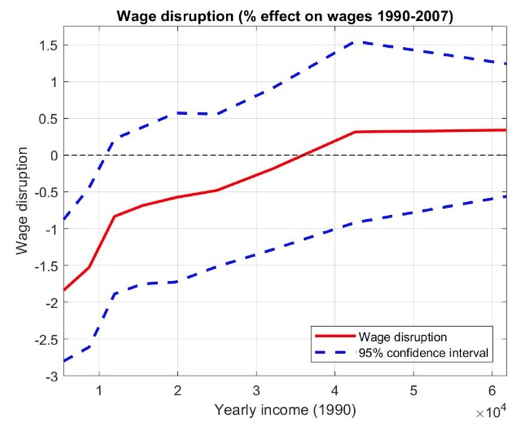 See Card (2009) for the impact of immigration, and Katz and Murphy (1992) for the impact of technical change on wages. Antras et al. (2016) have analysed the problem of compensating the effects of trade on inequality in a related framework, with restricted tax instruments.